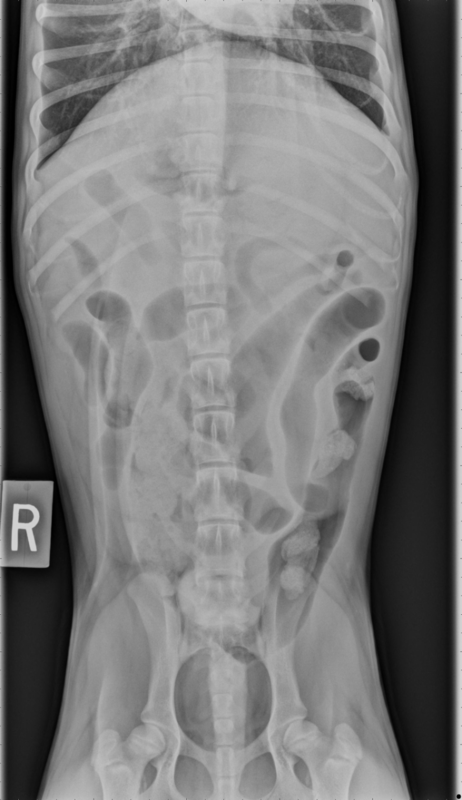 At times, it is essential to confirm the location of the large intestine on radiographs when determining if an intestinal lesion warrants surgical intervention. Negative contrast colonography, aka pneumocolon, is indicated to determine whether a foreign body or obstructive pattern is small intestinal in origin or to investigate large intestinal lesions such as intussusceptions and intraluminal masses. All you need is a large syringe, air and a long catheter (red rubber or Foley will do). Following the plain radiographic abdominal study, keep the patient in lateral recumbency on the x-ray table for the procedure. Rectally pass a lubricated red rubber catheter connected to a large syringe into the distal colon and inject air at an estimated dosage of 1-3 mL/kg body weight. A Foley catheter can be used to prevent backflow of air on injection but be careful not to over distend the balloon and damage the rectal/colonic mucosa. 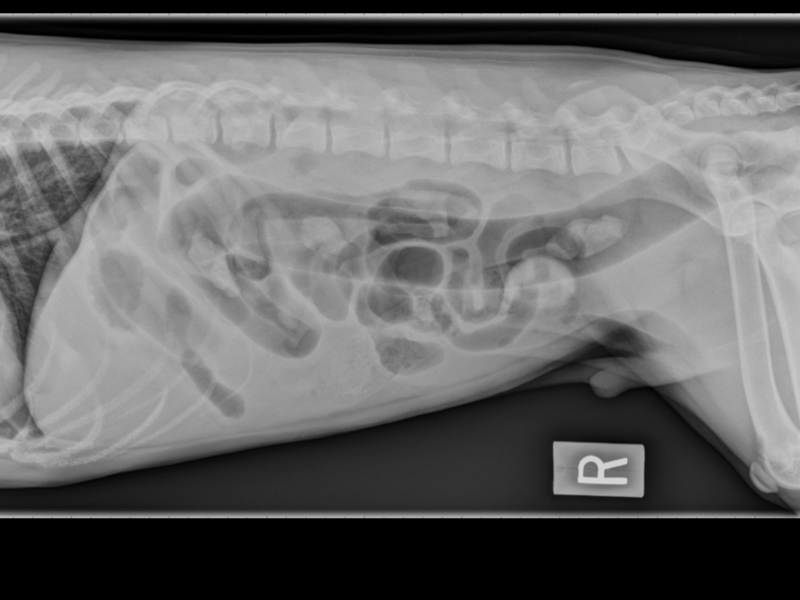 Perform lateral and VD views of the abdomen immediately following the injection. The goal is to fill the entire large intestine to the cecum. Try and limit air from getting into the small intestine so it doesn’t compromise the study. 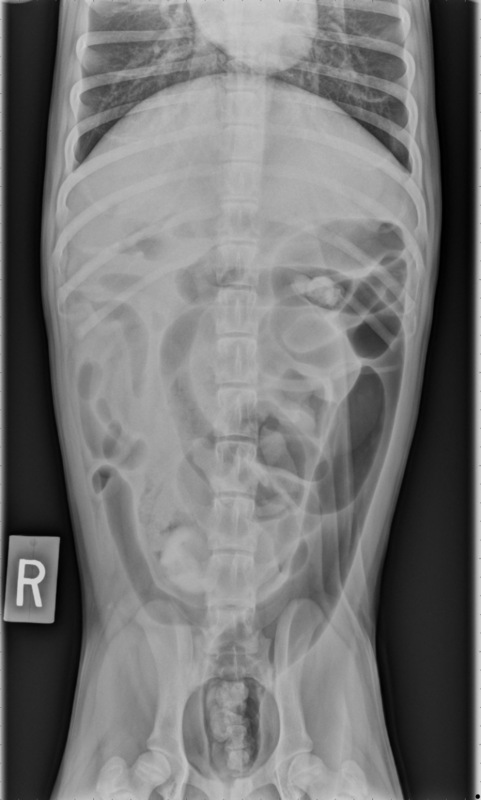 Taking incremental radiographs can be useful to ensure proper colonic distention. Give it a shot. This will be the easiest and cheapest contrast procedure you will perform! 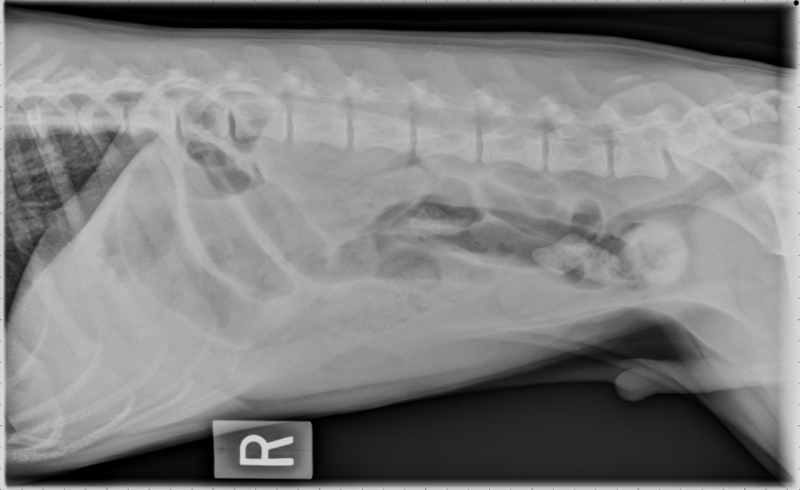 Figures 1 and 2: Survey right lateral (above) and ventrodorsal radiographs (below) of a male neutered mixed breed dog with a 2 day history of vomiting. A round, mineral-opaque foreign body is identified in the caudal abdomen at the level of L7 in the plane of the distal descending colon on both orthogonal views. A few dilated small bowel segments are visible concerning for mechanical ileus. Figures 3 and 4: A pneumocolon was performed and orthogonal radiographs were obtained. Gas delineates the large intestine confirming small intestinal origin to the foreign body and surgical indication.